One of the best-known is Sam Davis of Strangford Lough with Suvretta, who in recent years has cruised the Pacific islands in detail and then returned to Ireland single-handed round Cape Horn. At no time did his solidly-built Peter Brett-designed Rival 41 give him any cause for concern, and when I met up with him in port when he was nearing the end of his venture, Suvretta looked as though she had just been out for a turn round the bay. Yet while Suvretta may have doubled the Horn, she has still to circumnavigate the world. 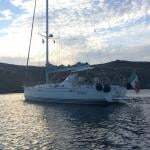 But now Leinster Boats have a Rival 41 newly on their books at €49,000, and this is a boat which has made a detailed circumnavigation with a noted husband-and-wife crew. Since then, this hefty boat has become a familiar sight on Ireland’s southwest and west coasts during her annual cruises. 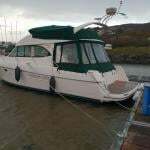 For although her owners are from Dun Laoghaire, they have used the key location of Cahirsiveen Marina in the heart of Kerry’s cruising paradise to maximize their regular ease of access to an area which cruising folk from elsewhere can only longingly dream of. However, for this winter the boat is laid up ashore in New Ross on the Wexford/Waterford border, and thus she’s very accessible for viewing. And for aficionados of the Rival 41, the good news is that she does have the second companionway down aft giving direct access to the cockpit from the accommodation. The original layout drawings suggested that the only access to the excellent accommodation would be via a single companionway amidships, but the Rival 41 for sale in New Ross has a second companionway down aft giving direct access to the cockpit. When the design first appeared in 1973, it hinted that the only access below would be via a substantial “coalhole” companionway in the middle of the coachroof immediately forward of the mainsheet track. Admittedly this gave access to really superb accommodation, as the layout plan shows. But very quickly, would-be owners insisted that while the midships companionway worked fine in port or in gentle weather, at sea it could be a menace. Fortunately, there was space to incorporate a second companionway directly off the starboard side of the cockpit’s forward bulkhead, and that is preferred at sea so much that in the case of Sam Davis with Suvretta, the main amidships companionway is sealed off completely when a major voyage is contemplated.